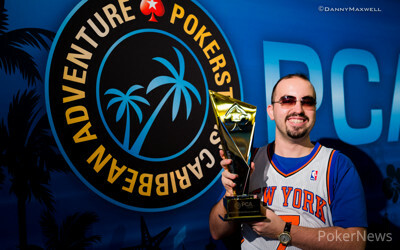 After finishing third in the same tournament in both 2011 and 2015, Bryn Kenney won the PokerStars Caribbean Adventure $100,000 Super High Roller for a $1,687,800 after beating a stacked field of 58 entries including World Series of Poker Main Event champion Joe McKeehen heads up. The win put Kenney on $8.3 million live tournament earnings, and up to 54th on the all-time money list. "It feels great, I didn't have a Super High Roller win, and no tournament win that you can be proud of, it was always third, second, in these big tournaments and to get a win is just the best," Kenney said after lifting the trophy. 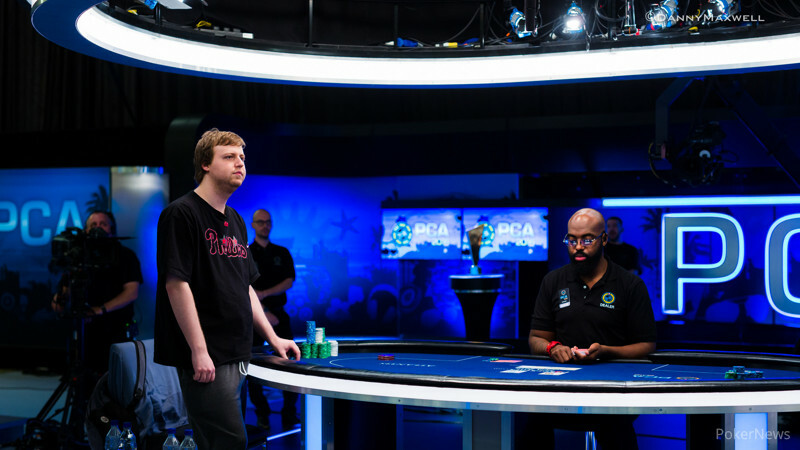 The final table started with six hopefuls looking to capture the first big title of 2016, and it took quite some time before the field got whittled down to five. It was Isaac Haxton who busted out in sixth place, but not before seeing some huge swings put him near the top of the counts. On a big hand versus David Peters, Haxton climbed up the standings as his two pair beat Peters', but that was no sign of what was to come. While the action was still six-handed it was Ankush Mandavia who grabbed the lead after hitting broadway against Peters' top two pair, and the latter managed to save a lot of chips by folding to a big bet on the river with a four-card straight on board. On the 51st hand of play it was Mustapha Kanit who ended up all in with ace-five against Haxton's sevens, and an ace on the turn gave the Italian the double up. On the very next hand Haxton hit the rail when he shoved with ten-nine suited into McKeehen's ace-king, and the board brought no help. Haxton collected $360,060 for his sixth-place finish. No less than 10 hands later, two hands played out back-to-back involving Mandavia and a ton of chips in the middle. On the first one it was Kanit who was at risk for 1.2 million holding ace-nine against Mandavia's ace-six. The board brought mere blanks and Kanit doubled up, after which Mandavia was all in himself right away. Mandavia held ace-three against Kenney's king-queen suited and the former's ace-high held up to keep him in the game. On hand 83, Kanit doubled up again, this time through Peters who was left with just a few big blinds. Kanit shoved with ten-nine suited and doubled through Peters' ace-king after hitting a straight on the turn in a preflop all in. Three hands later Peters found himself all in and at risk with ace-nine against Kenney's ace-ten, and the board brought blanks to get the tournament down to four players. Peters collected $461,340 for his big run, and he now has more than $10 million in live tournament earnings. Kanit was next to go in fourth after he ended up all in with pocket sevens in a blind battle against Mandavia's ace-jack offsuit. Mandavia hit a straight on the river to send Kanit to the rail, who collected $596,360 for his efforts. With three players remaining Mandavia maintained his lead for a while, but ultimately he was the next player to get knocked out. Mandavia dropped some chips to Kenney before getting knocked out holding king-four against Kenney's king-nine suited in a blind battle. Mandavia took home $787,640, more than doubling the biggest live tournament result of his poker career. Kenney started the heads-up battle with 7,945,000 versus McKeehen's 6,550,000, but things were far from over. Kenney extended his lead to over 10 million, but things swung all the way back around in McKeehen's favor. After a short break, during which Kenney only had 10 big blinds left, a double-up spree started for the WSOP bracelet winner who took down the tournament a few hands later. Kenney won the biggest tournament of his poker career, while McKeehen added another seven-figure score to his poker resume, and now more than $10 million in career earnings. Hand #159: Joe McKeehen looked at on the button and he raised to 480,000. Bryn Kenney held in the big blind and he made the call. The flop came down and McKeehen bet 400,000, which got Kenney to fold. Hand #160: Bryn Kenney raised from the button to 525,000 with and Joe McKeehen called. The flop brought out and both players checked. The turn was the and McKeehen bet 575,000, which was called by Kenney. On the river the hit and both players checked. McKeehen won the pot with a pair of eights. Hand #161: Bryn Kenney received a walk. Hand #162: Joe McKeehen received a walk. Hand #163: Joe McKeehen raised from the button with to 480,000 and Bryn Kenney looked down at and he moved all in. McKeehen called right away and a coin flip was upon us for a pot worth 11,330,000. The flop brought out and Kenney flopped trips, putting him way out in front. The turn didn't change things, with the , and on the river the it was all over when the hit. McKeehen was knocked out in second place, while Kenney lifted the trophy and took home the first-place prize of almost $1.7 million. Hand #156: Bryn Kenney looked down at the and raised to 525,000. Joe McKeehen, who held the , defended from the big blind and the two watched the flop come down . Both players checked, the turn put three nines on the board, and McKeehen check-folded to a bet of 450,000. Hand #157: McKeehen raised to 480,000 with the and Kenney called with the . The flop saw Kenney check and then call a bet of 410,000. When the paired the board on the turn, Kenney checked, McKeehen bet 1 million, and Kenney folded. Hand #158: Kenney raised to 525,000 with the and McKeehen, who held the , moved all in. Kenney snap-called off for 5.205 million and suddenly there was 10.47 million in the pot. Kenney was a heavy 72% favorite, which jumped to 87% on the flop. The turn gave McKeehen chop opportunities, but it did not come to pass as the blanked on the river. With that, Kenney took a commanding chip lead. Hand #155: In the first hand back from the break, Joe McKeehen moved all in and Bryn Kenney called off. Kenney was a 66% favorite, which improved to 87% on the flop. Kenney was ahead with aces, but McKeehen did pair his nine. The turn was a blank, and so was the river. Kenney doubled to 5.6 million while McKeehen dropped to 8.9 million. The final two players are now on a break. Hand #153: Joe McKeehen raised to 400,000 with m Bryn Kenney called with the , and the flop came down . Kenney check-called a bet of 340,000, the appeared on the turn, and action went check-check. The river saw Kenney check, McKeehen bet 1 million, and Kenney check-raise to 3.37 million. "I was value betting," McKeehen said before thinking over the situation. Eventually he made the call and took down a massive pot to chip up to 10.87 million. Kenney was left with 3.625 million. Hand #154: Kenney raised to 425,000 with the , McKeehen called with the , and the flop came down . McKeehen checked, Kenney bet 370,000, and McKeehen called to see the turn. McKeehen checked his trips, Kenney checked behind, and the completed the board on the river. McKeehen fired out 750,000 and Kenney released his hand. Hand #145: Joe McKeehen raised from the button with to 400,000 and Bryn Kenney called with . The flop came down and Kenney checked to McKeehen who bet 340,000 and Kenney folded right away. Hand #146: Bryn Kenney limped with and Joe McKeehen raised with to 600,000 and he picked up the pot. Hand #148: Bryn Kenney raised from the button with to 425,000 and Joe McKeehen folded. Hand #149: Joe McKeehen raised from the button and he picked up the pot. Hand #150: Bryn Kenney limped with on the button and Joe McKeehen checked with . The flop brought out and both players checked. The turn was the and again the action was checked. The river was the and McKeehen won the pot with a bet of 225,000. Hand #151: Joe McKeehen raised with to 400,000 and Bryn Kenney looked at , with which he three-bet to 1,070,000. McKeehen tanked for a bit before shoving and Kenney folded right away. Hand #152: Bryn Kenney gave Joe McKeehen a walk. Hand #143: Joe McKeehen raised to 400,000 with the and Bryn Kenney called with the . The flop saw Kenney check, McKeehen bet 340,000, and Kenney call to see the turn. Kenney checked, McKeehen did the same, and the completed the board on the river. Kenney, who made aces and queens, bet 1.165 million and McKeehen folded. Hand #144: Kenney raised to 425,000 with the , McKeehen called with the , and the flop came down . McKeehen check-called a bet of 565,000, the dealer burned and turned the , and McKeehen checked for a second time. Kenney bet 1.285 million, McKeehen called, and the completed the board on the river. McKeehen bet 1.5 million with his pair of sevens, and Kenney, who rivered a straight, made a quick call. With that, Kenney took down the 7.61 million and reclaimed the chip lead. Who Will Walk Away with the 2016 PCA SHR Title & $1,687,800 First-Place Prize?